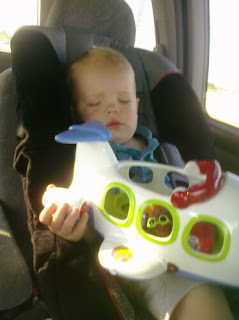 Jackson loves airplanes. Simple airplane noises will keep him from throwing food on the floor during dinner. 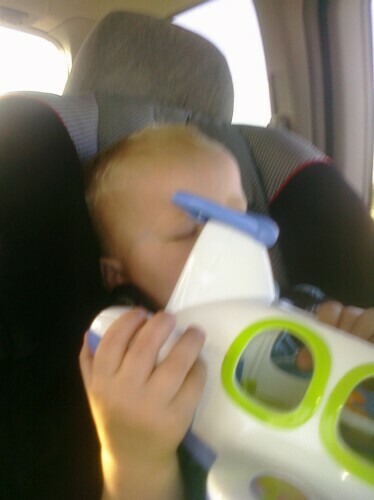 He loves his toys that are airplanes. When he sees an airplane...holy cow. The Reynolds got him the airplane Little People set. 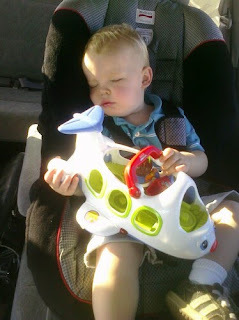 Right afterwards we headed to Vincent's first birthday party. He insisted on taking it with him. We thought he might insist on brining it in to the party as well, so when he fell asleep, we decided to take it from him. Notice how the grip gets tighter (and becomes a 2 hand hold) in each picture and the airplane gets closer and closer to his body. I think it's safe to say the gift was a hit! Thanks Reynolds. It was the last thing he let go of to go to bed, and the last word he said before sleep "AIR PAIN" and opened his hand to show a passenger in one hand and pointed to where the plane was with the other. Then, sleep.